Their shift in perception correlates with a $9 million project SGPA recently completed this spring for San Diego Unified School District. A project designed with the students at Kearny High School in mind. A project that in its best of intentions, would clean up the athletic fields and facilities. A project that, in actuality, has rejuvenated the spirits, attitudes, and motivations of student athletes and inspired the community near this San Diego high school campus. 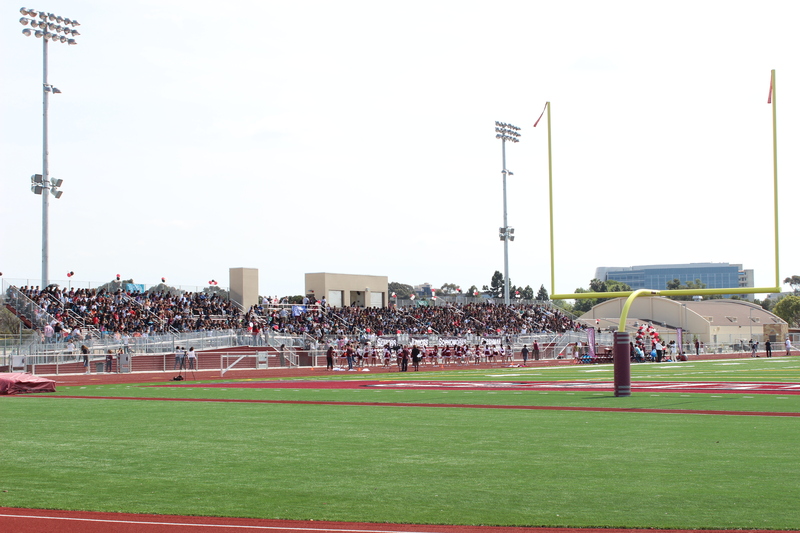 Kearny High School, home of the Komets, now boasts a modern athletic complex – one of the newest athletic fields and facilities of high schools within the San Diego Unified School District . State-of-the-art amenities now enhance this 74 year old campus as the first installment of several campus-wide upgrades due in part with Proposition S funds. 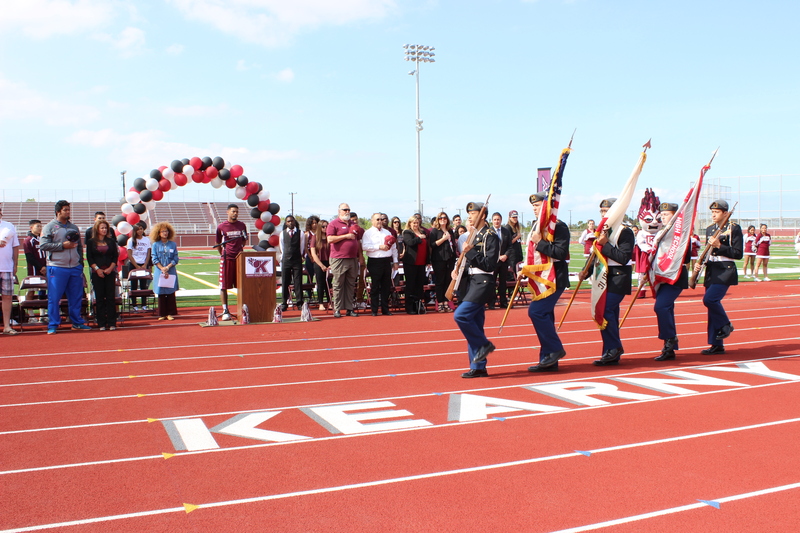 This project is more than a success story for Kearny High and its students. It serves as a necessary reminder of how sports, fitness, and team comradery can help shape a young adult. New facilities with modern upgrades can spark interest, improve engagement, trigger participation, and reinforce healthy lifestyles. At a pivotal point in their development and transition into adulthood, teenagers are highly influenced by improvements such as those conceived and developed for Kearny High School. With the proper facilities and foundation to succeed, students will be more apt to adopt beneficial behavioral patterns, leading to healthy and enjoyable habits throughout their lives. Teens are impressionable young adults, and often favorable group consensus leads to a predetermined thought: I want to be a part of that. “I’ve never seen so many kids turn out for a track season before. The improvements around our field encouraged students to sign up. Something clicked for them,” said Coach Aaron. Exercise is necessary to maintain health, both mental and physical. Sometimes, the challenge is merely tying up one’s laces and getting out there. Enhanced environments typically foster enriching experiences, ones that people generally want to try for themselves. For teenagers, quality athletic facilities can play a huge role in their development and engage them early. Having facilities and fields like Kearny’s, conveniently on campus, also engages them often. 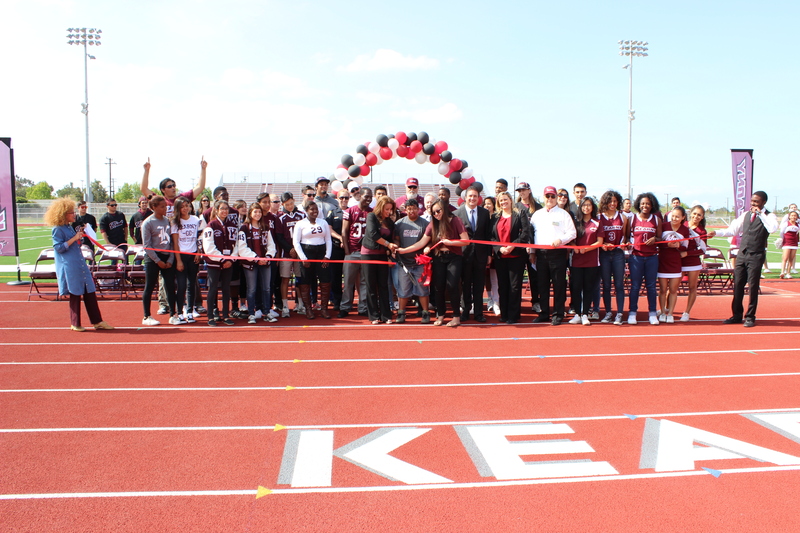 More than mere aesthetic upgrades, the athletic field and facilities improvements at Kearny High School have thoroughly and thoughtfully impacted and enhanced daily lives for those involved, on and off the field. At SGPA, that’s the underlying mission we strive for: to produce thoughtful, intelligent, advanced designs, creating modern and advantageous environments in order to make lasting impressions on an individual’s or community’s life. The construction is part of a larger effort to upgrade the high school facility as required by Proposition S. Improvements will include accessibility, infrastructure, and technology upgrades. SGPA successfully managed the process of developing consensus with students, community members, district officials, and government representatives on a rigorous design schedule. When they return to classes in the fall, homecoming will be that much more enjoyable from their brand new bleachers, and the six home games in the evening will most certainly be well-attended. When asked what his first thoughts were upon seeing the project completed, Coach Aaron didn’t hesitate. “Love. Pure, unadulterated joy.” He, along with the whole Komet family, has been waiting for this transformation for a long time – the effects of which are sure to last even longer. Client Testimonial: Kearny High School from SGPA Architecture and Planning on Vimeo. 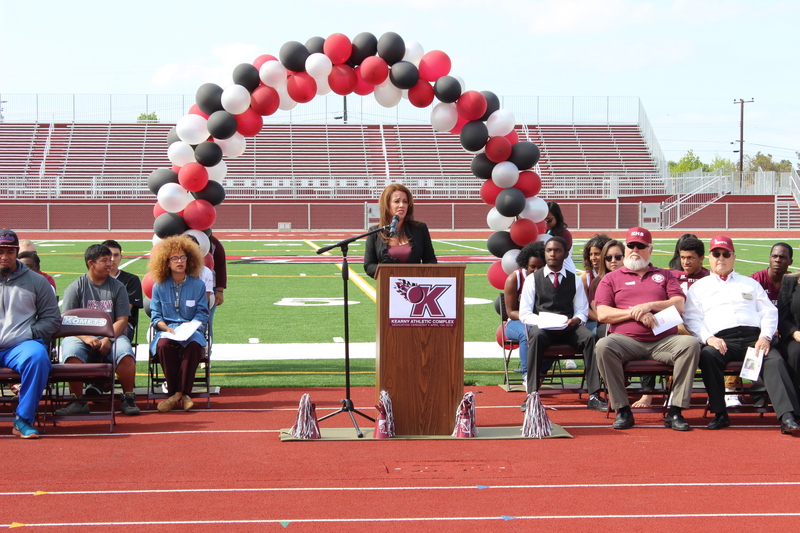 Kearny High School Principal Ana Diaz-Booz offers welcoming remarks at the Dedication Ceremony, April 10, 2015. Student athletes and faculty prepare to cut the ribbon at the new field. A full crowd in the new bleachers. This will draw more athletes & fans. I wish we had it in the ’50’s.